Hotel El Patiaz de la Reina Rana *** This small, attractive, brand new hotel, opened 2007, offers comfortable accommodation situated in Tauste, a charming village with Mudejar architecture and surrounded by picturesque landscape. The village forms part of the Cinco Villas Valley where the surrounding countryside offers walking enthusiasts superb walking terrain with numerous footpaths complemented by chestnut and pine forests, fruit orchards and diverse wildlife. The Bardenas Reales National Park is also close by. More information. Husa Hotel Monasterio Benedictino**** Renovated old Benedictin monastery from the XVI century with 35 rooms, located in the centre of Calatayud, very close to the historical area. Charmy and cosy hotel. More information. Sercotel Torico Plaza*** The hotel has 31 exterior rooms where you can see the Mudejar Tower of El Salvador and the Fountain of the Plaza del Torico. More information. Hostal La Trucha*** Situated in the impressive and unique mountain landscape of Alto Maestrazgo, the hotel is set in the building that used to house the first national mint and a textile factory. The building is now a 3-star hotel establishment, completely surrounded by nature. You will be close to the Organos de Montoro, dreamlike landscapes, clear clean waters, blue skies, lush vegetation and near the source of the River Pitarque. 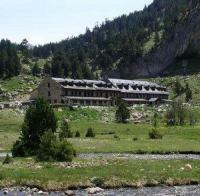 The hotel is also situated next to a river rich in trout, which will be the only sound you hear. More information. Hotel La Iglesuela del Cid**** Located in an 18th century historic building, the Matutano-Daudén Palace, in the centre of the pretty village of the same name, Iglesuela del Cid is the ideal place for a restful break. The Sierra del Maestrazgo provides the ideal atmosphere for relaxation and tranquillity. More information.